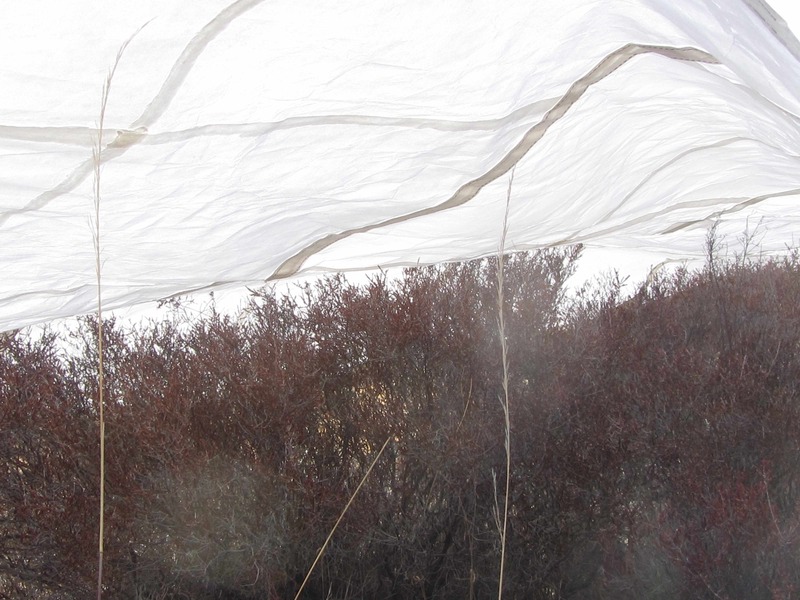 Hosho paper tarpaulin covers the grasses amongst the yellow jacket trees. 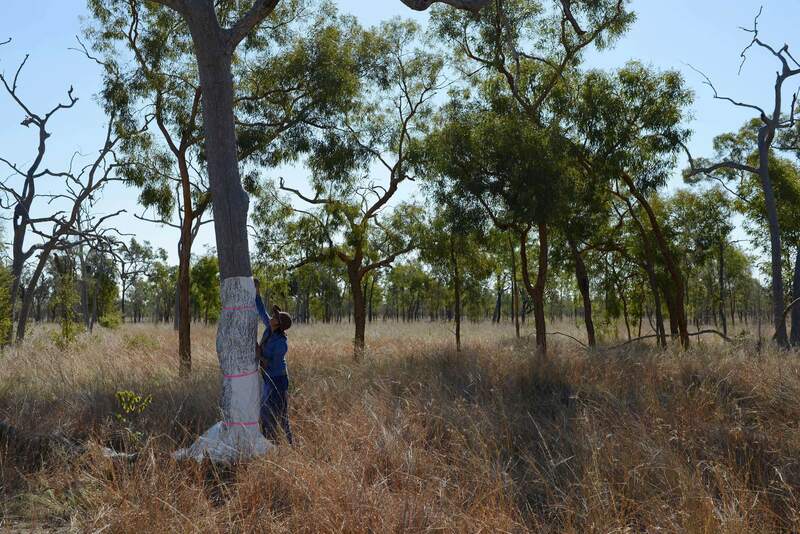 Image by Greg Harms/Emma Harms 2013. On my second trip to Bimblebox in September 2013 I took out a paper tarpaulin made by a canvas tarpaulin maker. Already it was showing signs of tearing and folding by the process of sewing the pieces of hosho paper together by a commercial sewing machine. 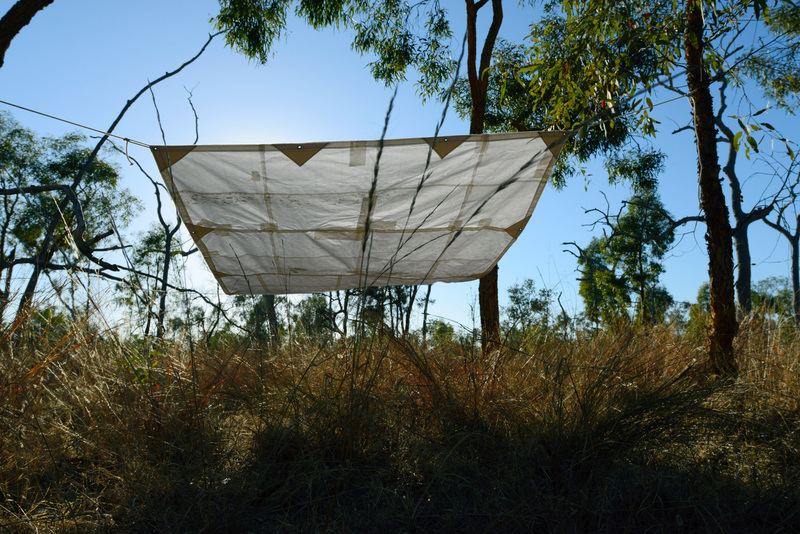 On arriving at the Nature Refuge, I set out to tie the tarp over ‘demarcated’ areas of shrubby heathlands, spinifex communities and pockets of yellow jacket trees and grasses to symbolize the protection or isolation of these ecosystems. 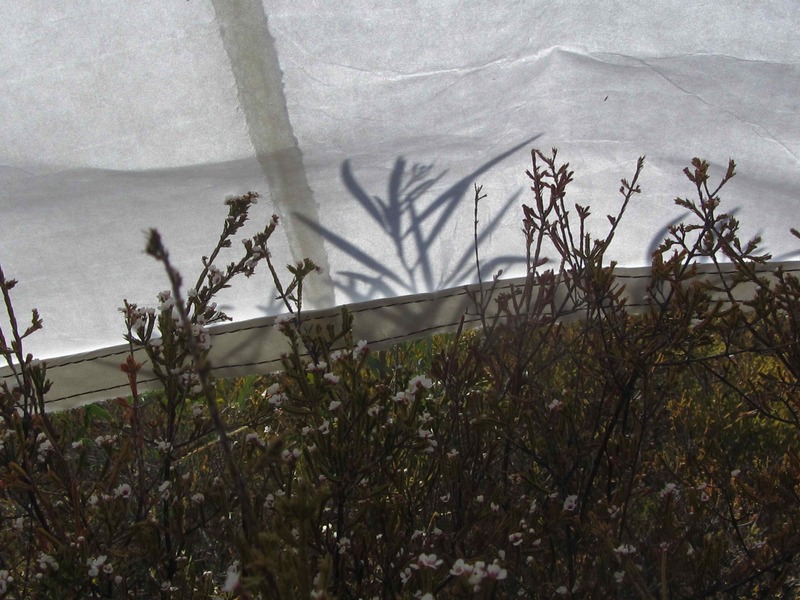 I photographed the area beneath the ceiling provided by the tarpaulin to offer a glimpse of these localized plant species. In the studio, a blended liquid of charcoal from the Bimblebox (eucalyptus populnae) is applied to the paper by different methods of soaking, splattering or imprinting. 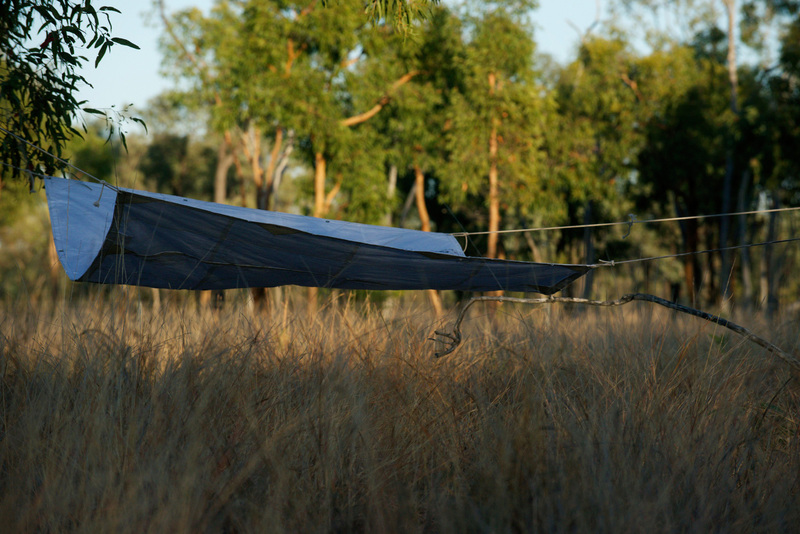 Jude Roberts frottaging the marks left by borer insects amongst variety of grasses and Large fruited yellow jacket trees . Image Greg Harms 2013. Another tarp is made from tyvek and has been frottaged to resemble ancient text or sacred inscription. These hieroglyphic marks are made from rubbing graphite onto marks made by boring insects on the dead trunks. These trunks are a life source to many organisms. I imagine the markings to be some form of divine thinking or message as was the case in ancient civilizations. 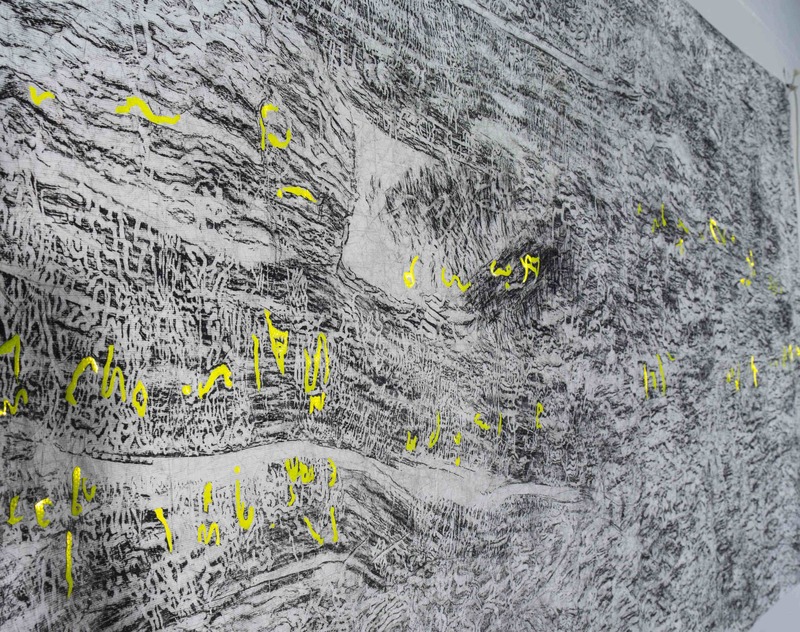 This technique of rubbings or ‘frottage’ is also a way of conveying an absolute concrete reality . Fluorescent text is added to the graphite markings. Image Carl Warner 2013. During this visit to western and central Queensland it occurred to me that my aim ‘to make visible’ (of the Galillee Basins and other groundwater systems) is also happening in a different way with the use of highly visible fluorescent objects by road construction and mining companies. This changing landscape since I left the area in 2005 is now a part of the dramatic visual changes in Queenslands inland communities. I love the concept,, especially the last one with the borer markings. I have many photographs of borer trails on tree trunks and branches.